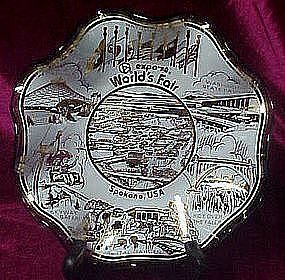 Vintage collectible wavy edge dish was a souvenir of the 1974 Worlds Fair Expo. Made of smoky color glass with white and gold decoration. Measures 6 3/4" in diameter and is in pristine condition. Scenic features are Spokane Washington, Nations flags, The US Pavillion and the washington State Pavillion, The ride over the falls, Skyway Safari, And the Oriental Gardens.